Moscow mayor Sergei Sobyanin has overseen mega projects that have drastically changed the face of Europe's largest city, but his critics accuse him of stifling opposition. A loyalist close to President Vladimir Putin, Sobyanin became mayor in 2010, when he replaced Yury Luzhkov who fell out with the Kremlin. The white-haired career official governed the oil rich Siberian region of Tyumen before being unexpectedly summoned to Moscow by Putin in 2004 to head his administration. Sobyanin was brought up in a small Siberian village -- a fact that has irritated some of his born-and-bred Muscovite electorate. Under his leadership, Moscow City Hall has pushed through massive re-development projects that have made the Russian capital greener and less congested. His critics, however, accuse him of disregarding property rights, while replacing diverse cultural life with bland government-sponsored events and tacky decorations. Under Sobyanin's second term, city hall has also repeatedly refused to issue protest permits to the liberal opposition. Part of this is a legacy of the mayoral election of 2013, in which opposition leader Alexei Navalny almost forced the incumbent to a run-off. Despite the near upset, standing against Navalny made Sobyanin a rare Russian official to face real electoral competition -- winning him admiration in the Kremlin. "He's withstood the test of electability. He's the only person who competed against Navalny and won. I think that's well remembered," said Russian analyst Andrei Kolesnikov. 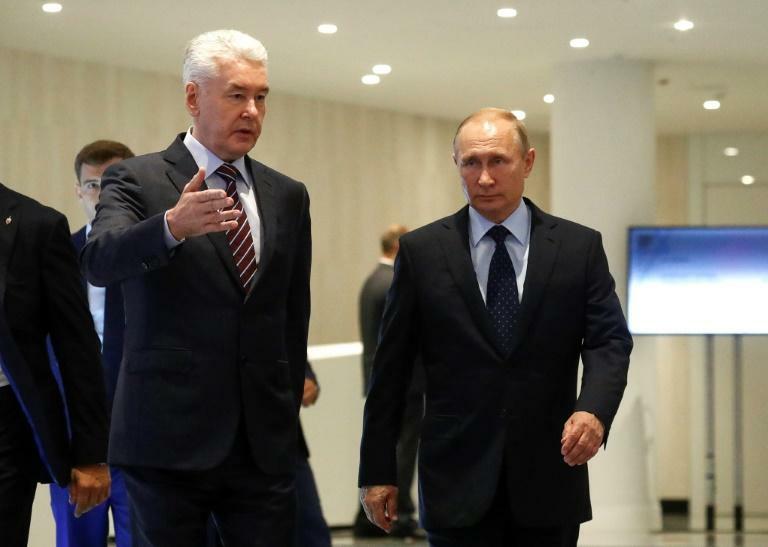 Fully in character with Putin's own strategy, Sobyanin's public appearances are tightly controlled and he has not taken part in any election debates. Sobyanin's ambitious plans to remake Moscow have often turned the city into a vast construction site for months at a time. "He has a personal wish to make Moscow more like other modern European capitals," analyst Alexei Makarkin told AFP. His makeover of Gorky Park, previously a garish rusting fairground, proved his first resounding success -- where trendy 20-somethings now lounge in deck chairs and watch open-air films in a space originally designed for Soviet workers. Last year the city opened the 14 billion ruble ($205 million) Zaryadye park just steps from the Kremlin, boasting an ice labyrinth and became a symbol of Sobyanin's Moscow. The mayor has also brought in a bike-sharing network, like those in London and Paris, as well as electronic pedestrian crossings and universal swipe cards for public transport. Putin recently praised his ally saying "Moscow has become a real trendsetter in the quality and comfort of the urban environment". But analysts say these projects have a political aim -- to tame the urban middle class that led Russia's anti-Kremlin protests back in 2012. "Those who previously went out (to protest) are now ready to get behind Sobyanin," Kolesnikov said. Critics have also said some of these projects are too pricey at a time when the country is trying to recover from recession. While Moscow's middle class is divided over Sobyanin's style of governance, analyst Makarkin said his redevelopment programmes have appealed to the city's poorer population. His controversial $50 billion plan to raze thousands of Soviet-era pre-fab apartment blocks sparked street protests in central Moscow. But according to Makarkin the suburban working class largely welcomed the prospect of moving to new housing estates. Kiosk and stall owners resent Sobyanin, who has cracked down on a once-chaotic shopping environment by closing street markets. In 2016, authorities demolished around a hundred kiosks at night using bulldozers and put thousands out of work. Since then, many of Moscow's once bustling fruit and vegetable markets have been turned into quasi shopping malls with expensive cafes. But Makarkin said Muscovites have embraced the capital's new look, that contrasts with the free-form urbanism of the 1990s. "Moscow is shining, that's what matters to people."